We had gifts waiting in our room when we arrived. Writing does have its advantages. The crew on the Carnival Liberty treated us like royalty. 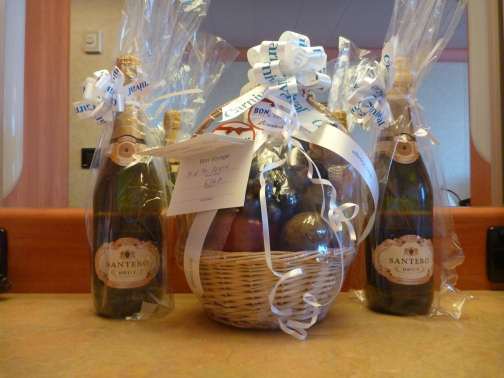 When we arrived our room greeted us with champagne and fruit baskets, gifts from some of the ship’s staff. Every afternoon we got random deliveries of a variety of tasty treats. Everything from hors d’ oeuvres to fancy pastries to chocolate covered strawberries came knocking at our door. 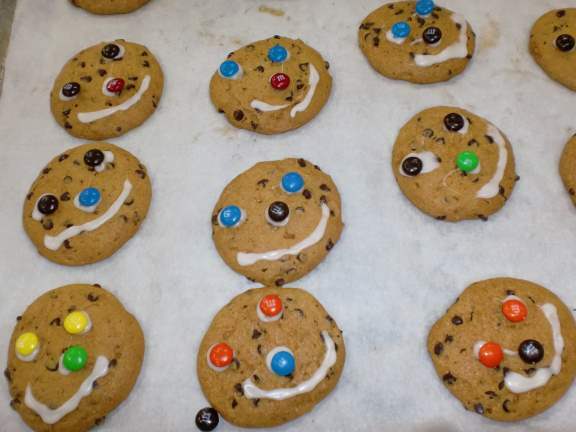 After John commented on how much he would like some cookies destined for the children’s area that we saw on a kitchen tour, the next day we had our very own plate of chocolate chip cookies with frosting happy faces delivered to our door. Private tours are another writer’s perk. The maitre d escorted us on a private tour of the kitchens just ahead of the public tour other passengers could take. 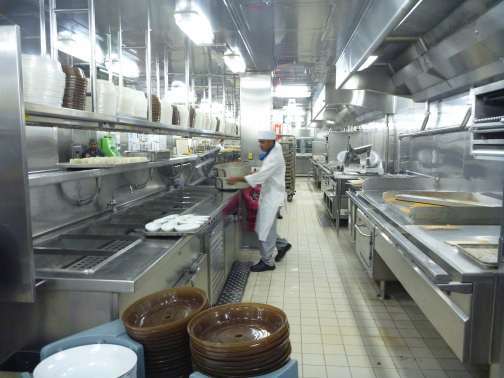 Just the sheer size of the galley is pretty amazing, and the amount of food that passes through there. It had separate rooms for just about everything. One for meat, one for fish, areas for baking, for plating, for preparing vegetables, each in their own space. 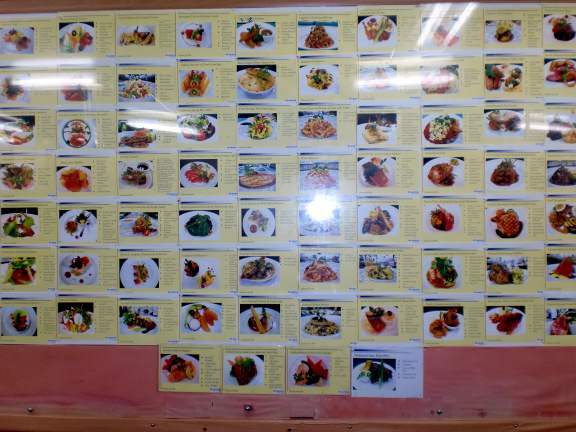 They even had pictures hanging on the wall of what each dish on the main menu should look like when ready to serve to the passengers. Following the kitchen tour, we went below decks where we saw all sorts of things passengers don’t normally get to see. The ship had quite a number of refrigerators and freezers holding a seemingly endless supply of food and drinks. A peek into the laundry leaves one wondering how the crew there doesn’t get overwhelmed by the sheer volume of it. Enough mountainous piles of things waiting to get washed to fill an entire house to the satisfaction of a hoarder who could become so lost under all that laundry that no-one would ever find them. 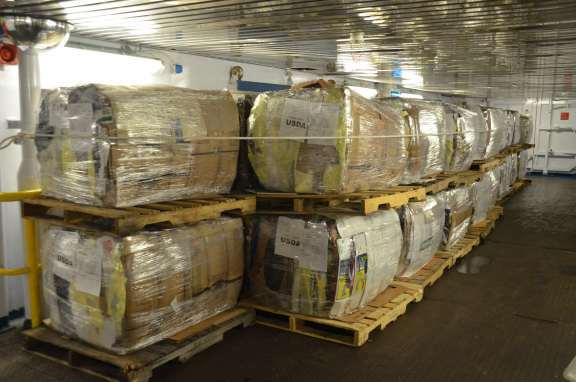 The ship, of course, has much more room than a house and a multitude of large washers and dryers, so they aren’t likely to loose any crew in the dirty laundry. Most of the laundry consisted of things like sheets and towels, but they do wash clothes for passengers who request laundry service as well, and had racks for those items. Laundry service on cruise ships tends to cost more than I care to spend so I’ve never used it. Carnival’s ships all have launderettes where passengers can do their own laundry in coin-operated machines for a lot less money than having their things washed by the crew. The Liberty had a large space dedicated to recycling. Stacks of cardboard bales dominated the view, but they recycle just about everything. At one port we even saw them taking many mattresses off the ship, which they donated somewhere local when they got new ones for the crew. The most interesting part of the tour (I thought anyway) was getting a glimpse into the life of the crew. We didn’t see any of their actual rooms where they live, just a peek down the hallway, but we did get to see other crew spaces. They had more than one dining room, so different nationalities had places to go that serve the type of food they eat at home. The people who are considered staff rather than crew – that is those who live and work on the ship employed by outside vendors rather than the cruise line – had a separate dining room from the crew. It looked somewhat fancier, and is where the new wait staff trains before serving the passengers. Captain on the bridge by the floor window. The crew bar was empty when we toured, but gets lively during their time off. Our tour guide said the bartenders consider the crew bar the best place to work because they leave better tips than most passengers. The crew bar had a porthole window, likely a popular spot since most crew live in inside rooms with no view. It also had some video games. They need to have some fun and relaxation since they will spend at least several months on board working between each trip back home. 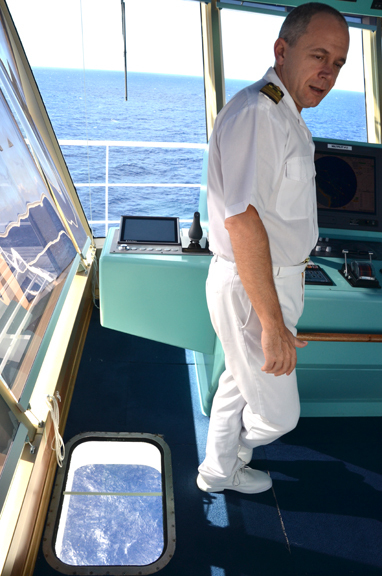 We also got a chance to meet the captain and have a tour of the bridge. It had the usual tiny steering wheel. Old fashioned large ones are no longer needed as modern ships run on a computer system rather than hand steering. It also had some interesting windows in the floor so the captain can view the life boats and any activity in that area. This entry was posted in Carnival, Liberty, Shipboard Life and tagged behind the scenes on cruise ship, Carnival Liberty, cruise ship bridge. Bookmark the permalink. Fun to go on the cruises but I’m not sure I’d like working on one, especially in the laundry room – oh horrors! I have to agree that much laundry is the stuff nightmares are made of. Washing all those dishes wouldn’t be much fun either. Fascinating. I’ve never done this tour so I was very interested. Thanks for the photos! I always enjoy seeing the inner workings of the ships. 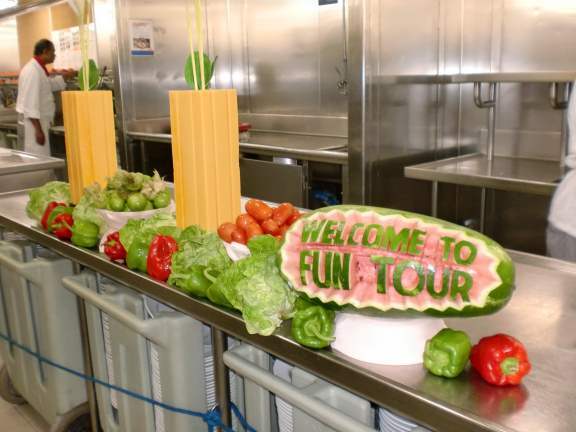 Touring this cruise ship revealed the secrets of the inner workings of the ship. My favorite part of the tour was the bridge, where the captain and his officers control the ship and steer it from port to port. I also loved the kitchen, where dozens of chefs worked hard to provide world class food. There were so many things in the kitchen that we couldn’t even find all of them being served later that day. Those kitchens must be expensive too. There was so much stainless steel. One thing you didn’t mention was that they also delivered sushi once or twice. I know you don’t eat raw fish so you probably didn’t think much of it but we enjoyed it. Maybe some day I will convince you to give it a try. There was a place to get free sushi for everyone on the ship too. It was kinda out of the way so we didn’t find it until about half way through the cruise. There are so many things to eat on a cruise ship. The choclate buffet is always fun too. That little window in the floor on the port and starboard sides of the bridge is used to line up the ship to the dock. There is a line or point of reference down on the dock that must line up with the line painted across the center of that floor window.